Since the German revolution of 1923 the openly opportunist right-wing elementsin the German Communist Party, particularly the adherents of Brandler, have neverentirely ceased their fractional activities. Brandler's false policy takes the form of atendency to capitulate to the bourgeoisie and to form a bloc with the socialdemocrats. The right wing have never given up the hope of again assuming theleadership of the party and changing its policy; their fractional activity has at timesbeen relaxed, at other times it has been very intense. In its resolution on the fractional activity of Radek, Brandler, and Thalheimer, thefifth ECCI plenum observed that 'an organized fraction exists in the KPD, to which a few groups within the party as well as a group of members of the CPSU (Brandler,Thalheimer, Radek, and others) belong, and which carries on fractional work on thebasis of a political platform formulated in a series of articles and documents'. The plenum severely reprimanded Brandler, Thalheimer, Radek, and others, and stated that 'if they continue their fraction work they will inevitably place themselves outside the ranks of the party'. tactics, which they interpreted as a bloc with social-democracy; this might have led to impermissible obligations towards the left social-democrats and to the renunciation of an independent communist policy. political platform, the first drafts being embodied in various fractional documents. The Wittorf case provided them with the desired opportunity to attempt to put their fractional designs into effect and seize leadership of the party in order to change its political line as laid down by the sixth Comintern congress. . . . This was the starting-point of their quite open steps to organize their fraction. indignation of the KPD masses was so great that Brandler and Thalheimer were very near to expulsion from the party. But the ECCI and the CC of the CPSU, assuming that they would overcome their opportunist tendencies, gave them a last chance to improve and admitted them to the CPSU. reiterated their refusal. . . .
the Comintern. Shortly thereafter the same Hausen began to publish, as responsible editor, the fraction's paper Gegen den Strom (information bulletin of the opposition). This paper, as well as other material put out by the fraction, was sent to all party organizations and publicly distributed. platform for the forthcoming party congress. where at Galen's invitation Brandler made two fractional speeches, or, secondly, the fractional character of the paper which he edits, Das Volksrecht, which published Brandler's speeches and statements and waged a fractional struggle against the KPD. is given in Brandler's action programme, and in articles in the first issue of Gegen den Strom, and in Das Volksrecht. . . . The natural consequence which the members of the right-wing fraction draw from the basic theses of their platform is non-recognition of the decisions of the fourth RILU congress and the sixth Comintern congress, and the fight against these decisions. This road leads to an open and outright break with the RILU and the Comintern. On the other hand it becomes clearer every day that the right-wing fraction's political platform is drawing closer to that of the social-democrats. . . .
agents of reformism in the communist party. Not only do they reject the decisions of the fourth RILU congress and the sixth Comintern congress, not only do they refuse to obey these decisions, they are beginning to work actively against their practical execution, attempting to sabotage and counteract the political actions of the party taken to put these decisions into effect. During the armoured cruiser campaign they did the greatest damage by using the Wittorf case to intensify their fractional struggle against the CC of the KPD. . . .
straying leaders of the right-wing fraction. . . . In the last two months the conciliators have shown ever greater patience towards the right, and ever greater impatience towards the party. There is no concrete criticism of the ideas and actions of the right fraction, while the attacks on the party have grown sharper, and approximate more and more to the criticisms made by the right itself. Typical in this connexion is the political platform submitted by the conciliators to the politbureau of the KPD, signed by Ewert, Dietrich, Schumann, and others, in which the sixth Comintern congress slogan: 'Fight on two fronts, against the right and the "left" ', is replaced by a new slogan: 'Fight on two fronts, both against the right and against the inner-party line of the CC of the KPD.' 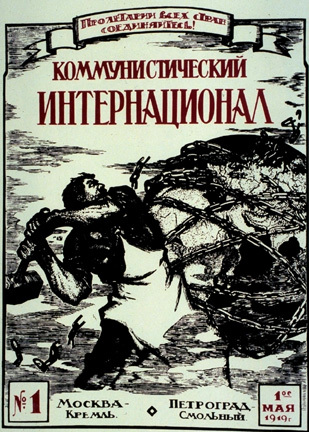 For the line proclaimed by the sixth congress of concentration against both right and left deviations from Leninism, the conciliators thus substitute concentration against the right (in words) and against the Leninist KPD (in deeds). It is clear that the KPD can no longer tolerate the splitting activities of the right wing, and that it must demand of the conciliators a complete break with the right as well as consistent struggle against them, under the leadership of the CC of the KPD. b. That they declare their unreserved agreement with the programme of the Communist International, in all its parts. . . .
discipline, and that they there fore explicitly declare that they will immediately cease to do so. . . . The rejection of these conditions will be followed by the immediate expulsion from the Comintern of all the leading members of the right. The ECCI presidium entrusts the CC of the KPD with the practical execution of all measures necessary for the fulfilment of these decisions. cease publishing the two papers mentioned. To the further question whether they were ready to obey unconditionally the decisions to be taken in their presence by the ECCI presidium, they again answered 'No'. Consequently the ECCI presidium decided to expel Hausen and Galen from the German Communist Party and from the Communist International. leaders of the right-wing fraction.